Initially I didn’t think we would be having any kind of Thanksgiving celebration, but then my mom started talking to me about her Thanksgiving preparations. And then I read a few articles about Thanksgiving food including this one from DesiGrub and this one about what to do with Thanksgivings leftovers. After drooling over those pictures from the New York Times, I knew I had to make some kind of effort to have a Thanksgivng. I didn’t have that Thursday off, so Tri and I had our Thanksgiving on that Sunday. Before Sunday arrived, we made a list of dishes we wanted to cook including some kind of meat dish, pea soup, mashed potatoes, and apple pie. We then went to Bhatbateni and stocked up on all of the ingredients we needed. Over the past few months, I’ve heard a few people mention that there are turkeys in Nepal, but nobody seems to know where to find turkey meat, so we decided to cook chicken instead. On Friday night, we marinated the chicken meat. I am no meat expert, and while Tri knows a bit more about cooking than I do, he isn’t an expert by any means either. So to marinate the chicken, we mixed in some ingredients that we thought might work including soy sauce, mustard oil, vinegar, garlic, ginger, hot pepper powder, and cumin. The meat soaked in those spices and flavors for about 24 hours before cooking. 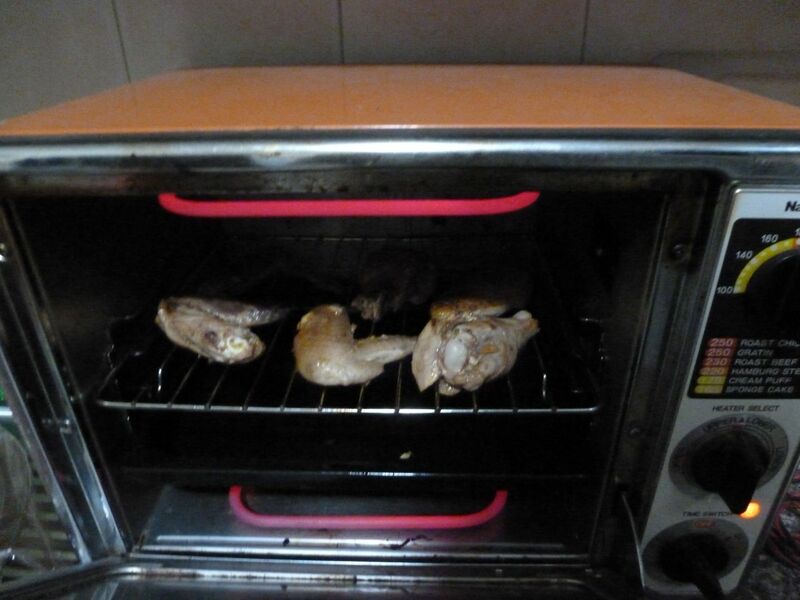 On the night of our feast, we decided to try baking the chicken in our miniature oven. Most Nepali houses don’t have built-in ovens, but you can get little ones that plug into the wall, which is what we have. After about half an hour of me squinting in through the window of the oven, trying figure out if things were actually cooking, the first batch was done. To my surprise, the chicken was actually good and not just tasty but tender and juicy as well. I’m not sure why it turned out the way it did because I have never cooked meat that way before, but I was very pleased with the result. Tri thinks that the vinegar may have had something to do with the tenderness. 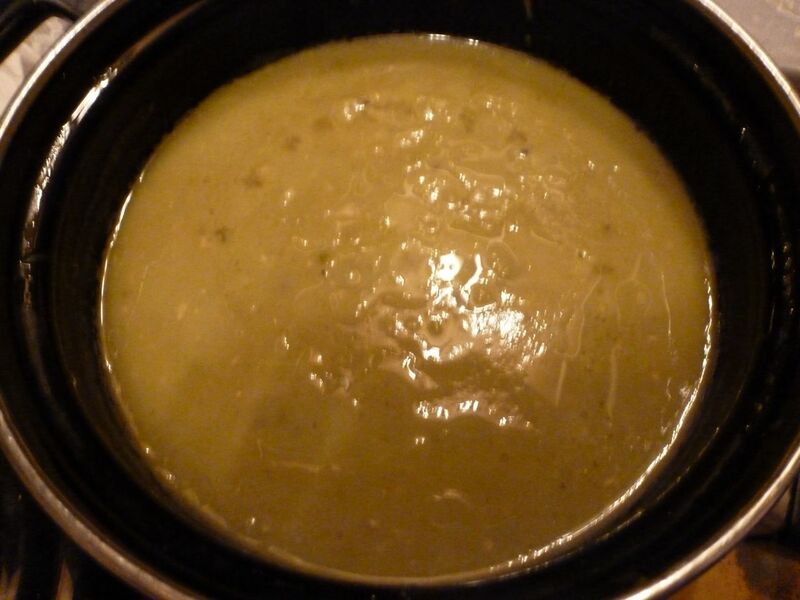 Before our guests arrived that night, we made the pea soup and mashed potatoes. There’s a dried bean found in Nepal called kerau that is similar to dried green peas, so after soaking some of those for about 12 hours, we started cooking them in the pressure cooker. We were trying to cook the soup American-style, so we didn’t add in too many spices, but predictably it turned out a little bland. I’m not saying that American pea soup is always bland. It’s just that I must have failed to add in some important ingredient. So in the end, to give it a kick, we added in a little bit of mustard oil. The mashed potatoes were pretty straight forward. The key is butter, which I added lots of 🙂 And they turned out great. Bhatmas are on the left. The spices to be mixed in are on the right. 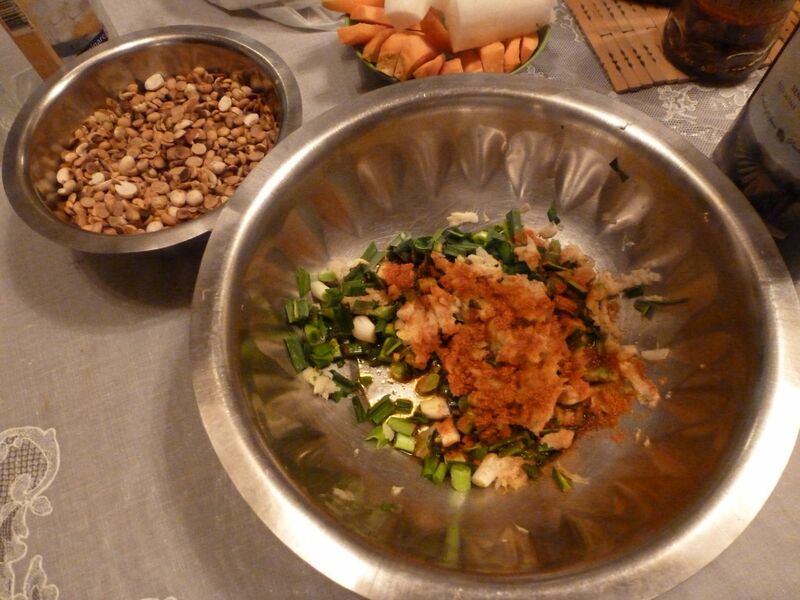 To compliment the American dishes, we had a Nepali appetizer. Buwa made some sandheko bhatmas, a snack of soy beans mixed with spices. He first fried the dried bhatmas (soybeans) on the stove and then added hot pepper powder, raw garlic, raw ginger, spring onions and salt to the cooled beans. It was delicious. Some family members also brought over a couple of pizzas. But the pièce de résistance was the Thanksgiving cake. I had initially set out to make a pie, as is traditional on Thanksgiving, but I don’t really know how, so I downgraded it to an apple crumble. However, when I baked it that night, something went wrong. It was dry and tough (maybe the apples weren’t the right kind?). Anyway, we didn’t end up serving it, but luckily we didn’t have to because we had the delicious cake that Mama and Maijiu (Tri’s uncle and aunt) brought over. 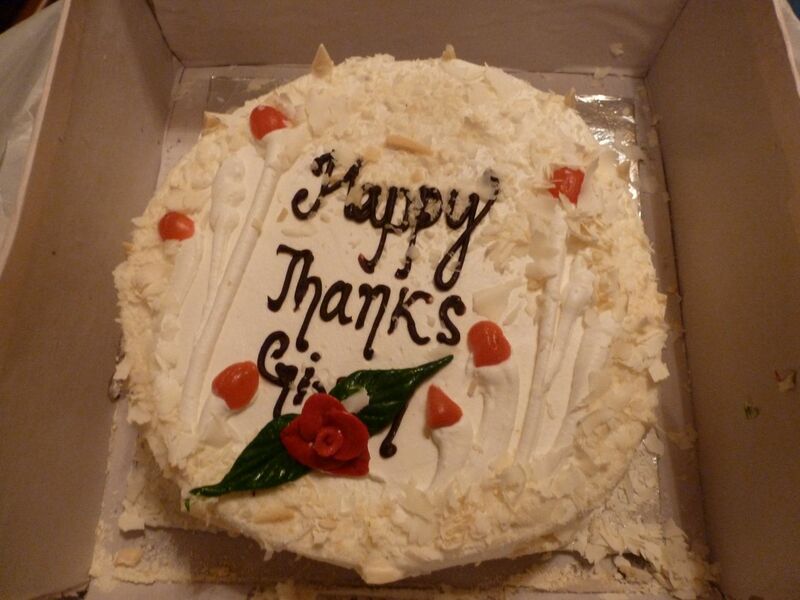 We were all a bit surprised to see the icing flower that the bakers had plopped right over the word “giving,” but after we took it off, we realized why. They had misspelled the word and used that decoration to hide their blunder! 🙂 I’ve never had a Thanksgiving cake before, but it’s a tradition I’m open to keeping around. Although our Thanksgiving wasn’t exactly traditional, I felt pretty good afterwards. I certainly missed my family in the US, but I had a good time with my family here and got to eat good food. I couldn’t ask for much more. Now I’m trying to think of ways to celebrate Christmas. We’re not supposed to be celebrating holidays this year, but since Christmas is not a Hindu holiday, I might be able to get away with doing something.